APC conducted our first visit to Vietnam and held a joint event with Ho Chi Minh City Peace and Development Foundation, reaching out to local philanthropists and government-related organisations on 7 July 2018. Since it is our first visit, APC learnt a lot on the local social sector from the local practitioners, returning Vietnamese who have set-up NGOs in the country, foreigners doing programmes with local partners and others alike. Everyone was eager to share and we discussed a myriad of issues, often going back to the complaints on unhelpful regulatory environment and authorities. Some of the participants were alarmed to hear of that low ranking and immediately questioned it. It quickly became a running theme throughout the day, and Laurence later brought up another report which had a different set of indicators that had placed Vietnam in a second tier category of “Doing Better”, amongst countries like Hong Kong and Korea. The Doing Good Index by Centre for Asian Philanthropy and Society examines the enabling environment for philanthropy and private social investment across 15 Asian economies. 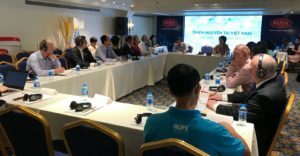 Clearly though, the earlier information had rankled some in the audience but this spurred some healthy debate and also made the local participants sit upright and want to engage further on Vietnam’s philanthropic performance beyond their own borders. Besides the global and regional ranking, the participants also raised concerns on the unconducive regulatory system in terms of taxation, registration and fund disbursement, that often prove to be huge hurdles for their work in the country. Country Representative for Asia Foundation, Michael DiGregorio, explained the government’s varying perspectives based on his experience on advisory committees with the government agencies. In the afternoon session, various representatives from organisations like the Vietnam Fatherland Front Committee and the HCMC Red Cross also provided their inputs to the group. Before wrapping up the event, our co-organiser and the main convener, Mdm Ton Nu Thi Ninh, a former career diplomat and a well-respected figure in the local sector, concluded that the event will follow up with a report which will be submitted with reflections to the National Assembly, the media will report on the day’s proceedings so that the wider public will also be exposed to what philanthropy has achieved in the country, and that she will be kick starting a newsletter for the local philanthropy community. All in, it as a very promising start to APC’s engagement in Vietnam. With a dearth of exchange on philanthropy, we believe APC can play a valuable role as convenor and catalyst. * The most recent version of the World Giving Index can be viewed here.